Red Rubber Inspirations: Happy First Birthday! It has certainly been an exciting first year at Red Rubber Designs! Today is our first birthday - our online store opened one year ago, today! I couldn't have done this alone. This past year I have been blessed with an amazingly talented Design Team! They have worked hard all year creating so many incredible projects featuring rubber stamps and patterned paper from Red Rubber Designs. I cannot say enough good things about these girls: They are all magnificent! And not only creatively - I am also blessed to be able to call them friends. These ladies have been with me for the past year, but sadly their time with Red Rubber Designs is coming to a close. Their term is up at the end of this month, but I thought it would be fun to showcase their awesome talent with you today. And, I've asked each one of them to choose their favorite project(s) over the last year and share it with you - so please take a few moments to visit each of their blogs (linked below) to see what they've picked! Everyone did such a wonderful job - it is so difficult to choose just one project! Sarah's beautifully elegant style shines through everything she does. Her projects most often display her vintage flair, but she also demonstrates her ability to create in other styles as well. Sarah was a huge blessing to me as she was my Design Team Coordinator over the last year. I'm not sure I would have managed without her! 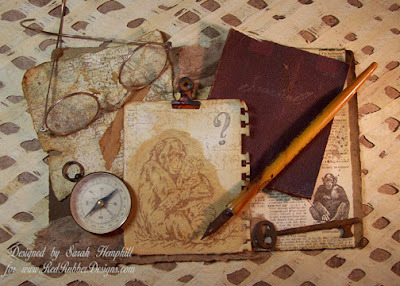 Kate often wowed me with her intriguing and beautiful mixed-media backgrounds. She turned every stamped image into something spectacular and continuously shows off different ways to create with rubber stamps. Louise Granlund, Kard Krazy Louise creates with a soft, romantic expression which makes all of her projects lovely to look at. She's been published many times by top stamping magazines and with good reason! Paula-Kay Bourland, Creative Stamping with Paula-Kay I call Paula-Kay the Queen of Copics! She has truly mastered the art of coloring stamped images and her projects really showcase her color skills. 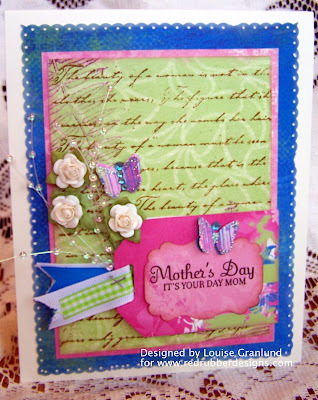 Cardmaking is her passion and it shows - they are gorgeous. Diana Queen, Wordbird's Nest Diana's projects can be easily defined by one word: Pretty! Everything she does has her feminine touch all over it - from the beautifully colored stamp images to her use of bows and other bling. These ladies are also responsible for the many fantastic tutorials created for you and posted here on the Red Rubber Designs Blog. They have worked hard and I cannot thank them enough! Please continue to visit their blogs - you won't be disappointed! I will be back soon with MORE - don't miss our Birthday Celebration - stay tuned! Happy 1st birthday from your 1st customer! What an amazing year it has been and so bittersweet to be losing your talented design team. They are some amazing talent for sure! Happy 1st Birthday!! Happy 1st birthday!! Here's to many more!! Happy 1st Birthday and many more!! Behind with my visiting, but so looking forward to catching up with this particular hop - happy birthday!! Last Day of our First Birthday Celebration!